REELRADIO - The Fred King Sean King Collection! Fred King at WROV, 1968, with another Diplomat console! "My mother was a professional violinist, my father a cellist whose main occupation was that of a history professor at a local liberal arts college. It was impossible to get away from music in that family, nor did we want to. We all played. Mom, the violin. Dad, the cello, my older sister, Joan, the piano and me, trumpet. Our musical tastes varied of course. As Mom & Dad were heavy into classical and founded the area's first symphony orchestra, I leaned more towards jazz, big bands and later rock n' roll. Looking back, I feel this musical upbringing had something to do with my interest in radio. It kept me close and in tune with what I had grown to love...music. When I was 14 or 15 years old, I began to frequent a local Saturday night dance known as "The Hangout", sponsored by the local Y.W.C.A. Somehow, I convinced someone to let me DJ. This required not only announcing the records and dances, but furnishing most of the music. (I had acquired a lot of popular 78's). This was all on a voluntary basis, of course. Little did I realize that ten years later, I would be "playing records" for a living. I completed my term in the US Air Force and was married in 1958. 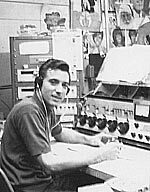 I had no radio experience whatsoever and was working as a cashier in a Chevrolet auto dealership in my home town of Lancaster, PA. I used to listen to an afternoon jazz show on WGAL at work. Ever so often, I'd call and talk to the DJ. One day he told me he was leaving the station. He suggested I try out for his job, adding, "What do you have to lose?" Much to my surprise and elation, I got my first job in radio. I stayed at that station playing MOR for 4 years. By 1963, my wife was pregnant with our third child, money was getting tight and the Program Director of a competitive station (WLAN) kept calling me and making job offers. The Beatles had arrived, record hops were booming and there was extra money to be made. I made the switch to Rock 'n' Roll in 1963. From then on, and for the next 20 years, I began jumping around to different stations. My travels took me to WFEC, Harrisburg, Pa, WYRE, Annapolis, Md, WPAC, Long Island, N.Y., WIRK, W. Palm Beach, Fla., WKKO, Cocoa, Fla., WROV, Roanoke, Va., KCUB, Tuscon. Az., WKYN, San Juan, P.R., WLOF, Orlando, Fla, and CK101, Cocoa Beach, Florida. Finally, I lost my wife and family. I also worked at a few smaller stations in two of those markets from time to time. 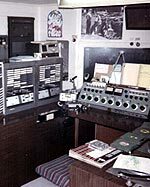 My full time radio career ended around 1980, although I continued to work part time at stations in Florida, and also when I returned to my home town in Pennsyvania in 1987. Looking back, I don't regret any of it. I know I lost my family, I know I wound up with no retirement, and I know I never became famous, or even well-known. But I loved radio and still miss it even today. It gave me a satisfaction that I never found with any other career, and I'm glad I was able to play a part in it when I did." The Repository thanks Fred Klein for sharing. 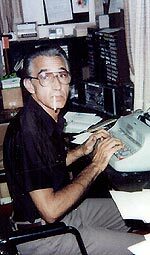 Fred passed away from complications of Parkinson's Disease in July, 2007.
. . . King Fred, King Fred, King Fred . . . This sample of Fred King on WFEC in Harrisburg was recorded on an overnight show in the Spring of 1967. Lots of promos, typical for top Top 40 stations all over America at the time. I don't recognize the Funtastic Fourteen Double Oh jingles, but it's fascinating to hear a bit of WFEC from this era. At this time, WFEC was the Number One radio station in Pennsylvania's Capital City. Carla, who is apparently a State employee, is up late tonight and sounding VERY nice on the phone. We'll forgive Fred for taking his time with this young lady.
. . . Number One in the Moon Port . . . Here's contributor Fred Klein as Fred King, the first time around at WKKO, in Missile Land (Cocoa Beach, FL) - and it's Thanksgiving, 1967. He's got PAMS jingles, reverb and a great time chime! This was back in the days when real radio stations, even in smaller markets, employed local tax-paying Disc Jockeys, many of whom had to work on holidays. In addition to his DJ duties, Fred presents a short newscast, sells a couple of bird dogs, and launches a search for a Cocoa Beach cheerleader jingle. Apparently, all the cheerleader jingles were on one cart, so Fred keeps hoping the right one will come up. Such were the days of limited budgets for luxuries like tape cartridges. 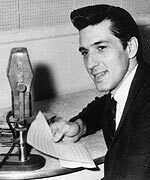 The music was restored by REELRADIO for this partially edited aircheck, originally recorded from the station air monitor. Overall, the fidelity at 44Kb/s is excellent. Thanks to Dennis Newhall and Tom Buck for help with the music restoration. Happy Thanksgiving, 2005!
. . . W-R-O-V, where the newswatch never stops . 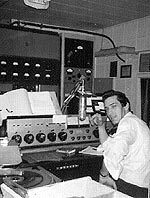 . .
Fred King (in the castle) does double duty with news and DJ duties on WROV in Roanoke, VA, June 1968. Some legitimate and "creatively edited" jingles are featured. Segments of the nighttime show (6pm-12M) were sponsored. Lendy's, a burger outlet and Davidson's, a men's clothier, are included in this 'scoped aircheck. Lots of production elements are featured! This is an honest example of one of hundreds of locally programmed Top 40 formats that knew nothing of "Boss" in the late '60's.
. . . It's a merry-go-round of Missile Land Fun . . . It's Fred King in Missile Land presenting the Top '69 Playback with classic PAMS jingles and masterful use of on-demand reverb and filter effects! Must have been a hot place to be at the time, with rock shows at Canaveral Pier and regular blast-offs just a few miles away. And once again, Fred is a DJ *AND* a newsdude... all part of the job.
. . . I'm Sean King, I play records for a living . . .
We are very grateful to contributor Fred Klein for this authentic snapshot of the legendary WLOF in Orlando, Florida from April, 1972. Fred appears as "Sean King" on this one. What an awesome radio station! Blending pieces of of PAMS Solid Rock and earlier series, TM's Phase II series, and lots of truly inventive production, I'm happy we have an aircheck that validates WLOF's legendary status. Extra points for fair use of Jim Runyon's "Well...", in the "Oh Lord, won't you win me a ten speed bike" parody promo. The Fred Sean King Collection has been a part of REELRADIO since June 19, 2005! Reel Top 40 Radio Repository ©1996-2014 REELRADIO Inc.